The story of bKash is intriguing. Moinuddin, CFO at bKash once shared how customers share mobile phones and replaces sim cards every time they would make a money transfer. 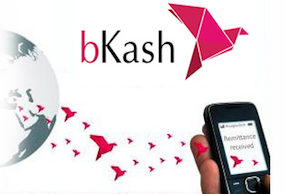 Against a backdrop of challenging statistics in the numbers of unbanked and low transfer amounts, bKash started in 2011 and has achieved commendable success. Starting as a send money platform, it is transforming itself to a service provider in remittances, airtime top up, merchant payments etc. The number of merchants accepting bKash now exceeds 30,000 and monthly transaction volume has exceeded USD 7.5 million. Moinuddin, CFO at bKash in Dhaka, Bangladesh shares his in depth insights of Bangladesh’s payments and bKash success at the GLOBAL Payment Summit 2016. After receiving a license to operate from the regulator-Bangladesh Bank in 2010, the journey of bKash started in July 2011. Over the last five years of operations, bKash has achieved commendable success. The total registered customer now exceeds 24 million with an active ratio (one financial transaction in a month) of 35%. While bKash started off as a send money platform, it is gradually transforming itself to a service provider going beyond just send money. bKash has been consistently trying to expand the suite of services to the customer by introducing airtime topup, bulk disbursements, straight to wallet foreign remittance, collection services, merchant payments & many such more customer centric products. In 2013, there were a little more than 75 organizations that were using mobile money for disbursements and there were 600 outlets where bKash was accepted as a payment medium. The total transaction in Dec 2013 was approximately USD 1 million. Since then there has been significant efforts by bKash to understand the customers to further penetrate into the merchant payment arena. One of the key implementation that was made was “small merchant” payments. Small Merchant is referred to the omnipresent “Mom & Pop” shops across Bangladesh. The retailing industry is fairly in the nascent stage in Bangladesh where the presence of organized outlets is very minimal and the average ticket size is small and hence in order to make a meaningful impact, digitizing payments in these outlets is key. The resultant impact of the various initiatives by bKash on the payment front can be best described through numbers. In June 2016 the total number of organizations that used mobile money exceeded 700 and the number of merchants accepting bKash payments now exceeds 30000. The total transaction volume in June itself exceeded USD 7.5 million. Whilst, there has been significant progress in the merchant payment arena there still remains a massive opportunity further expand digital payments which can come about through innovation and relevant value proposition both for the merchant and the customer.